Singer, guitarist, writer, producer and leader of the band April Wine, Myles Goodwyn’s passion and drive shaped and directed the group from its earliest beginnings. He is the only remaining original member of the group since the inception of April Wine in 1969. Goodwyn grew up poor and is the classic “small-town kid makes good” success story. As a young teen, Goodwyn honed his skills, playing in bands such as East Gate Sanctuary and Woody’s Termites. From the very beginning, Goodwyn plotted the course of the band. His unique but classic rock voice gives April Wine a distinct and immediately recognizable sound. Ranging from hard rock classics to soulful ballads, his vocal range and style can really grab a hold of you. His songwriting skills are prolific. He has penned virtually every April Wine song. He has a knack with words and seems to have an ability to write a catchy tune at will. Through the ups and downs and changing faces of the band, the one thing that has remained constant is Myles Goodwyn. Even today and with their latest release and shift in direction, his voice is as strong and apparent as ever. Now in its fourth decade, April Wine continues to charge ahead as one of Canada’s very best rock bands. And as far as rock history goes, Myles Goodwyn is already a living legend (especially in the annals of Canadian rock history), being known as one of the all-time greats. 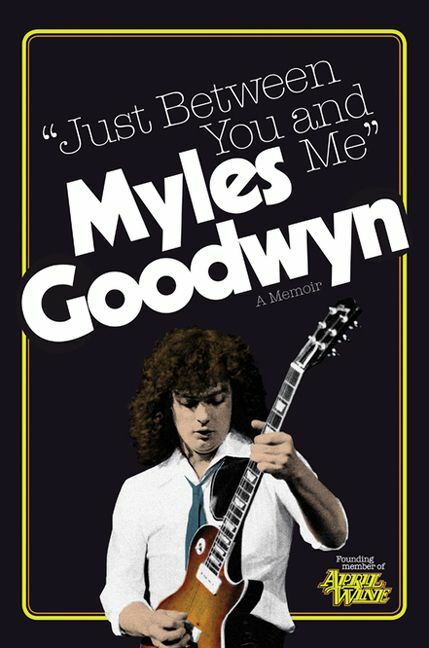 In Just Between You and Me, Goodwyn shares the story of his upbringing, first at home in rural New Brunswick and then in the music business as the lead singer of one of Canada’s most popular bands ever, April Wine. “I met Myles at nineteen years old when I worked an April Wine tour in 1976 . . . I truly love the man. His memoir is wonderful and a must-read for all fans of Myles and his band, April Wine.” - Paul Bronfman, Chairman/CEO of Comweb Corp. and William F. White International Inc. and Chairman of Pinewood Toronto Studios Inc.
Myles Goodwyn was born and raised on the east coast of Canada. His band, April Wine, has sales exceeding 20 million records and CDs worldwide. In 2002 Goodwyn received the SOCAN National Achievement Award and in 2003 the ECMA Lifetime Achievement Award for his impact on the music industry in Atlantic Canada. In 2009 he and his fellow April Wine members won the Canadian Music and Broadcast Industry Award, and in 2010 they were inducted into the Canadian Music Hall of Fame. In 2014 Goodwyn co-founded the charitable foundation Soleful Caring: Shoes for the Homeless. For over a decade he has campaigned internationally for the Juvenile Diabetes Foundation. He has homes in Quebec, Nova Scotia and the Dominican Republic.